I’m not exactly Lululemon’s target demographic. I mean, I could be. I grew up in Vancouver, where the company was founded, and I wear sub-size-12 clothing so it doesn’t “cost 30% more to make my clothes.” But according to some articles criticizing the athletic wear company, there’s lots ways in which I’m completely not the target audience. I’m Asian, but can pronounce the letter “L,” thanks. I also read Atlas Shrugged when I was about 18, but instead of it informing my life philosophy, I decided it was one of the worst things I had ever read. And I’m pretty stoked about the existence of birth control pills. So given the fact that I disagree with some of the company higher-ups on, well, life, I haven’t really felt the need to keep up with them. But then 2015 brought us a new and exciting development, which was a Lululemon beer. And I like beer. I also like getting the chance to be snarky. 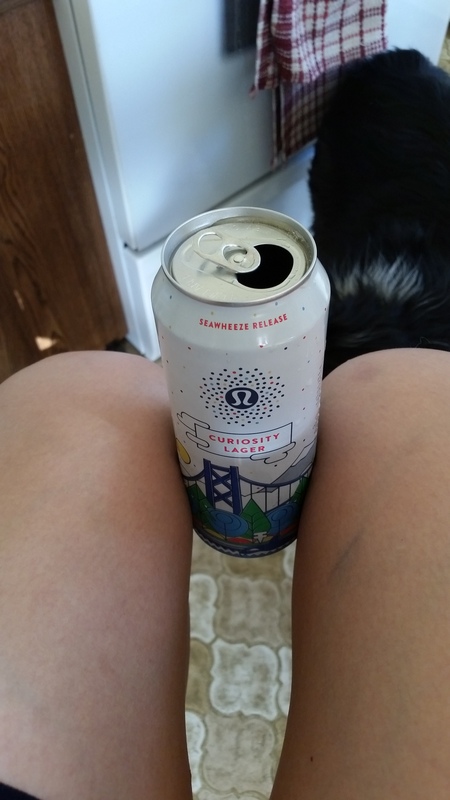 It also seemed appropriate that if I was going to buy any Lululemon product, it might as well be a can of beer from a local beer store, because frankly I’m intimidated by the prospect of even walking in to one of their brick and mortar shopfronts. The beer is made by Stanley Park Brewing to coincide with the SeaWheeze Half Marathon, and the inspiration is ostensibly the love of a cold beer after a sweaty run along the Seawall. Challenge accepted. 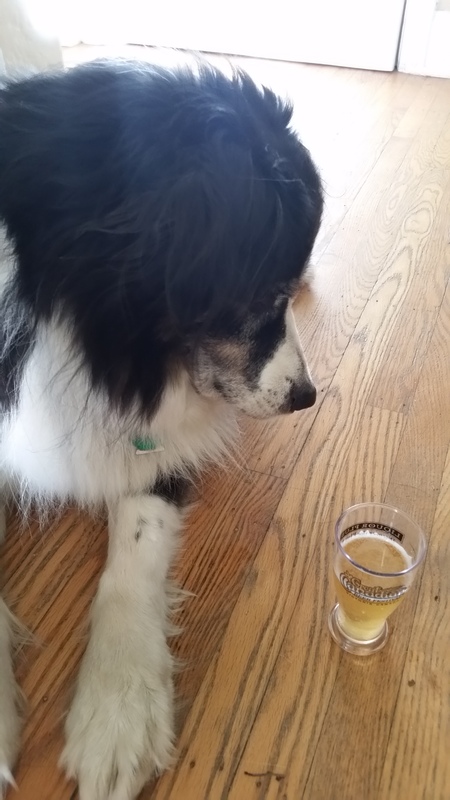 But since I’ve never written a beer review before, I enlisted the help of my dog (who wanted to go for a sweaty run) and my boyfriend, (who’ll always try a new beer). Painless, and a tall can was only $2.50, which is pretty good as far as Canadian liquor store prices are concerned. I spotted a stack of the cans (sold singly!) on my way to a barbecue at my brother-in-law’s place and didn’t even feel the need to hide it in a brown paper bag. Though I did stash it under the seat and left it behind in the car, because Lulu beer isn’t what you bring to a barbecue with a bunch of mechanics. I needed to enjoy it in an atmosphere which was more alienated from the means of production, lest the ghost of Dagny Taggart turn up and challenge me to arm wrestle. A pretty modest can that’s clearly meant to represent Vancouver’s Seawall, including a cartoon totem pole, for which it loses a bunch of points. Not exactly headdresses-at-a-music-festival level of cultural appropriation, but still not super cool. Especially for a company that sponsored an international day of yoga on National Aboriginal Day. When even Raffi disapproves of your actions, you’ve got to step back and evaluate. 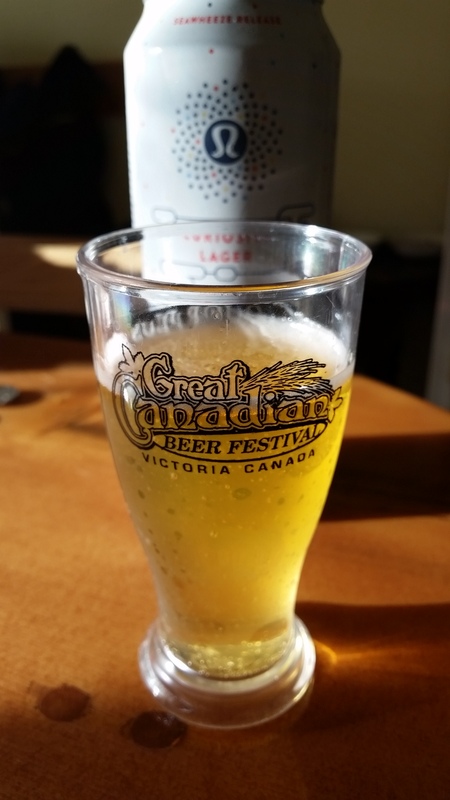 Since the ostensible inspiration for the beer was a celebratory drink after a sweaty run along the Seawall, my dog Bee and I decided that we should go for a short run in the park before drinking it to get closer to the full experience. So he agreed to pretend that I was a tall and leggy white girl, and I agreed to pretend that he was a well-behaved black lab or something. Target market, people. Luckily it wasn’t too hot, because even though Lululemon claims that their running wear is made for super sweaty runs, I suspect from their product photos that their definition of “super sweaty” is the kind where you still look super hot afterwards. Let’s just say that’s not the definition of “super sweaty” I’m familiar with. 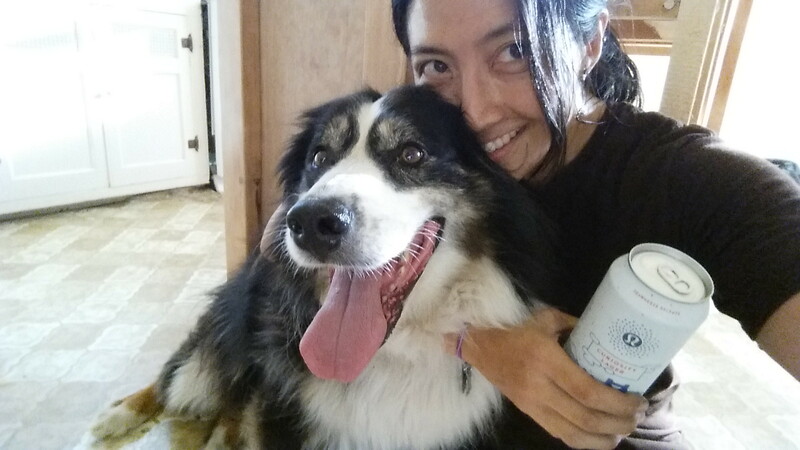 Anyway, the dog was pretty into the run and the selfie, but had basically no desire to drink the beer, which is fine, because let’s face it, he’s a dog and isn’t supposed to have beer anyway. The only reason he deducted 3 points from the review is because he didn’t get to go off leash for the run, because I wasn’t *that* willing to pretend he’s a well behaved black lab. The boyfriend (R) skipped the run and doesn’t do yoga, so he had to wait for the beer until we got home. We thought that maybe drinking it out of the 4 oz mini glasses we got at a beer festival once would make us cooler and more Lulu-acceptable. I at least felt a little more hipster, and isn’t that what this workout experience was all about? The verdict: Your basic lager. A touch of hops, light and refreshing. Pretty sure you could go out and order one of these after a yoga class, especially if you’re still recovering from the discovery that your pants were see through. R would rather have had a mountain bike ride and a Lucky Lager, but not bad. Kind of a North American Corona. In which case it’s basically the same quality of beer you can get anywhere else, but a little more pretentious. On the bright side, I finally got that thigh gap they’ve been telling me I should work on. Previous Post Do We Really Need Less Sleep as We Get Older? LOL at the thigh-gap picture. Oh, I get it! If you keep the beer between your knees you have both a thigh gap AND it negates the need for birth control pills. An added benefit for sure! While I’m sure Lululemon is too cool for school to do TV advertising for this beer, I’m immediately reminded of those awful Michelob Ultra Light ads from a couple of years back that promised that you could look hot from all of your workouts and still drink beer, even if that beer was…not really worth drinking. Hilarious. I feel the same way about LLL. And thigh gaps. Hilarious!! Thank you for doing this for me. Now I don’t have to. Thanks for the laugh! I really enjoyed this post. I am by no means the target demographic for the company which probably why explains I had no idea they made a beer. Ha! This is great. Didn’t even know they were making a beer. Seems a bit bizarre, but okay!